A lot has been written, as it turns out, on Canada's experience with fiscal discipline in the mid-1990s. 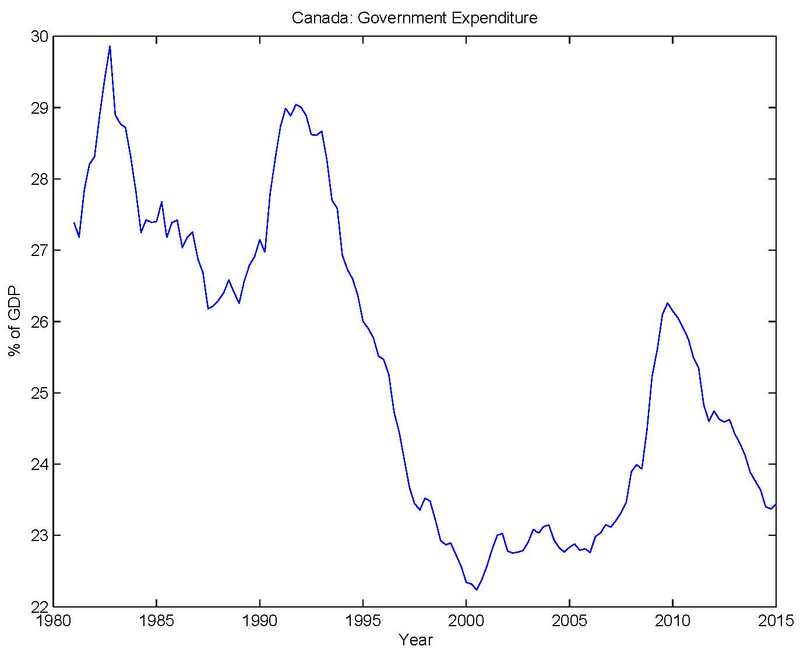 In 1993, Jean Chretien's Liberals were elected with a majority government and, with their February 1995 budget, embarked on a period of fiscal tightening. 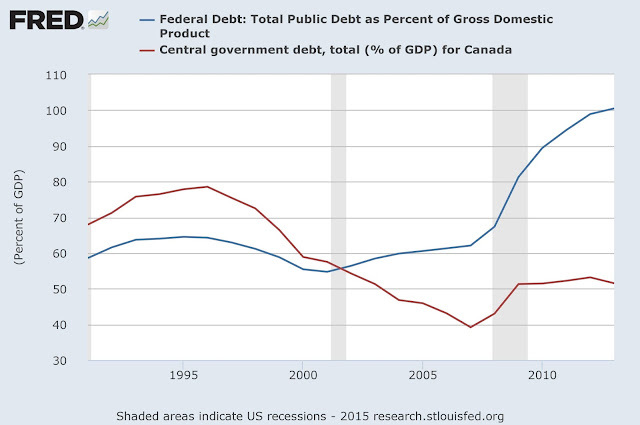 The change in policy was a response to a long period of federal budget deficits, and accumulating federal debt, which you can see in the following charts. The first shows the Canadian federal government surplus as a percentage of GDP, and the second shows the U.S. and Canadian federal government debt/GDP ratios. The Canadian finance minister at the time, Paul Martin, explained what he was doing at the 1995 Jackson Hole conference. His program focused primarily on spending cuts, particularly reductions in corporate subsidies, and reforms to unemployment insurance and federal transfers to the provinces. As well, the original budget proposed a 15% cut in federal public employment. 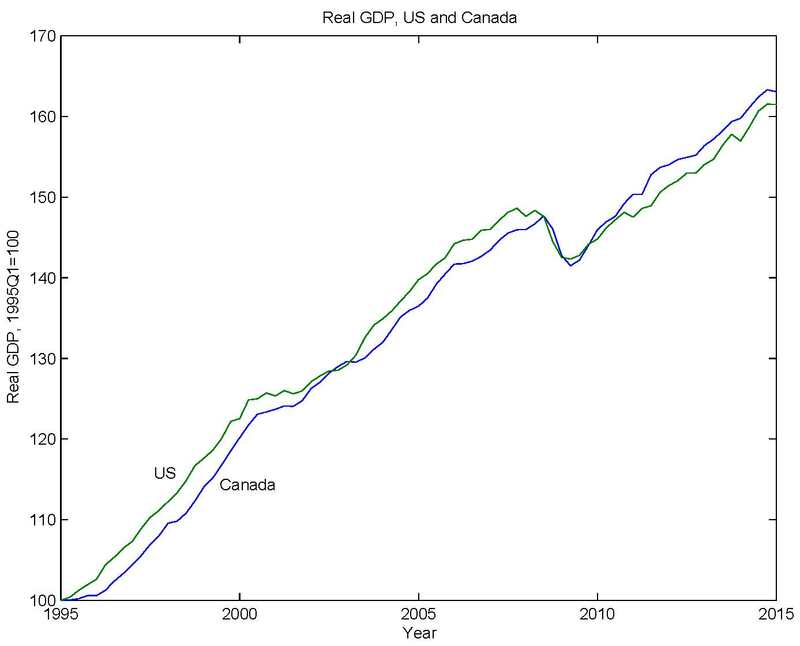 So, if you think that government spending, deficits, and government debt matter a lot for aggregate economic activity, this might give you pause. 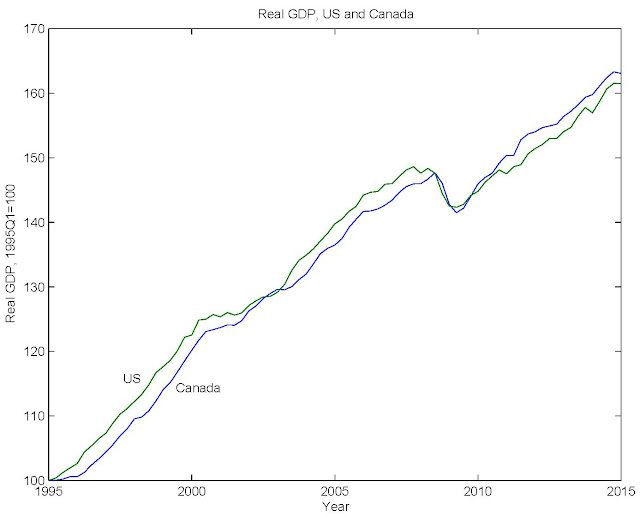 As you might imagine, this episode in Canadian macroeconomic history tends to be celebrated on the right. But left-leaning types aren't quite so happy about it. Canadian electors didn't seem to have a problem with it though. Chretien's Liberals were re-elected with a majority government in 1997, and again in 2000. 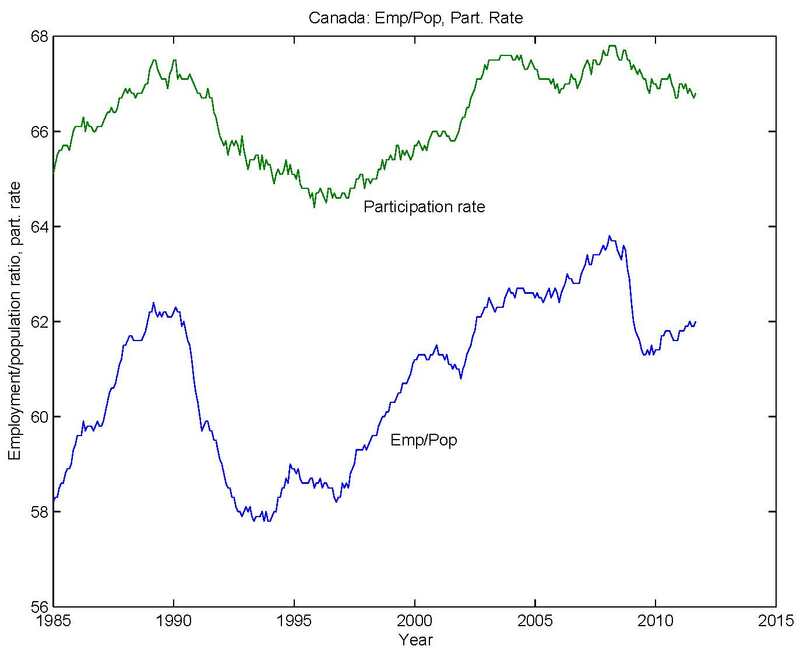 David Andolfatto discusses the early-1990s labor market slump in Canada in this blog post. This only looks like a recovery "well under way" (as Gordon puts it) if you're looking at it with hindsight. In February 1995 it wouldn't have looked so great. There had been a persistent decrease in the employment/population ratio and in the labor force participation rate beginning about 1990, and the unemployment rate stood at 9.6% - below its peak but still quite high. It was pretty common for people to observe those features in the post-Great Recession U.S., and call that labor market slack. So, if you are a textbook Keynesian, those observations would have to puzzle you. 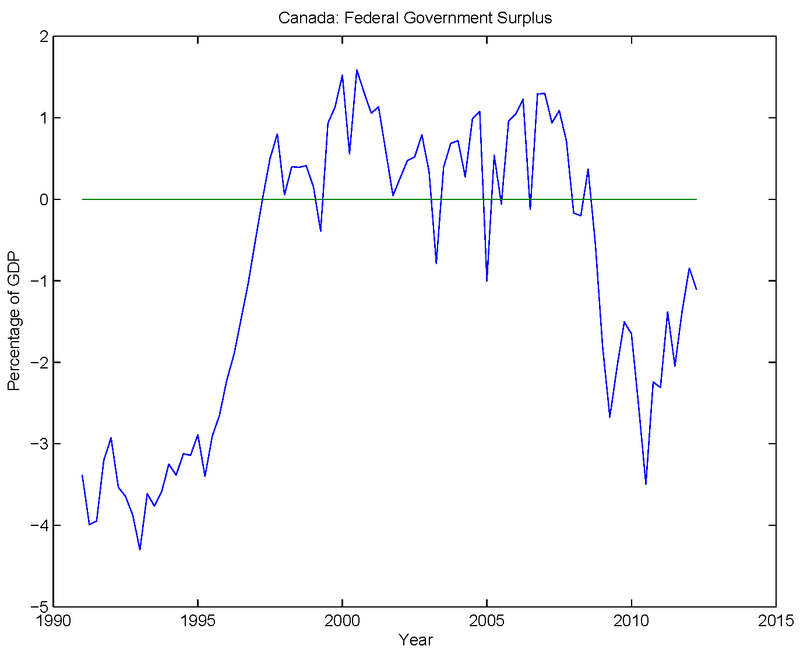 How can we radically cut the size of government in a slump and not see signs of big fiscal multipliers and disastrous aggregate performance? But, not so fast. Maybe monetary policy is helping things along? Indeed, in some discussions of the Greek crisis, people have suggested that Greece could have solved its problems in a more straightforward way if it were not tied to the Euro. A country with an unsustainable deficit has to correct that problem, but it's easier to do that if devaluation is an option. This has two effects, according to this logic. First, we can now pay back our debt to foreign creditors in devalued currency - we have implicitly defaulted on part of our debt, and have avoided the costliness of negotiating with nasty Germans and being thrown out of office by a grumpy electorate. Second, assuming sticky prices, our exports are now cheaper and our imports more expensive. Therefore, as long as the Marshall-Lerner condition holds, there should be an increase in net exports - i.e. a boost in Keynesian aggregate demand. Net exports practically moves in lockstep with the exchange rate. 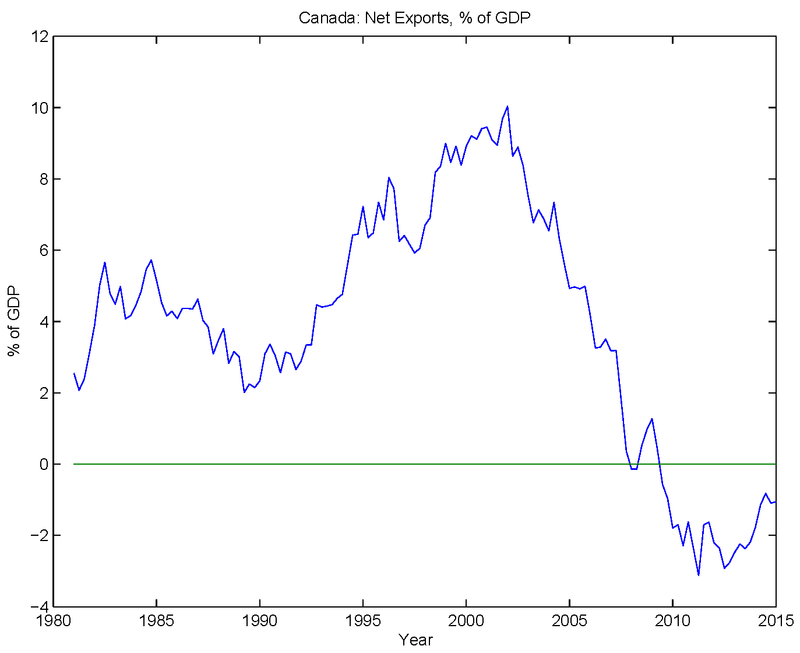 But, note that much of the increase in net exports in the 1990s had already happened by 1995. Further, beginning in 2000, the exchange rate depreciation and the increase in net exports quickly reverse themselves. It seems to me that, if a country is really interested in exploiting the effects of devaluation - whatever they may be - it needs the devaluation to be permanent. 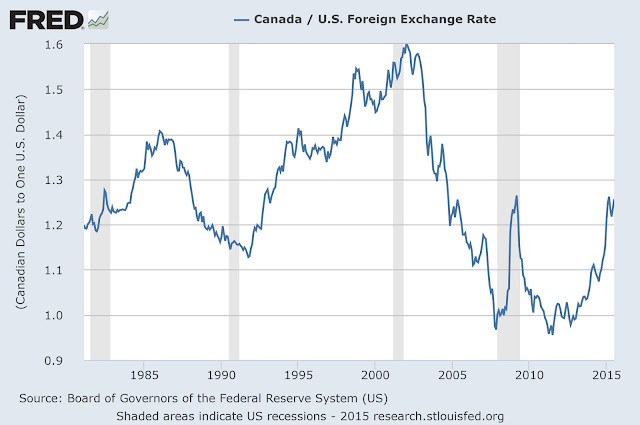 In this case, note that there is actually a net exchange rate appreciation from 1995 to 2005. So, if we used the overnight nominal interest rate to measure the "tightness" of monetary policy (which may or may not be appropriate), we might say that Canadian monetary policy was tighter than U.S. policy from 1985 through the end of 1995, U.S. policy was tighter for a two-year period from 1996 to 1998, and it's more or less a wash after that. But it might be more appropriate to think about monetary policy in terms of the ultimate goals of the central bank. 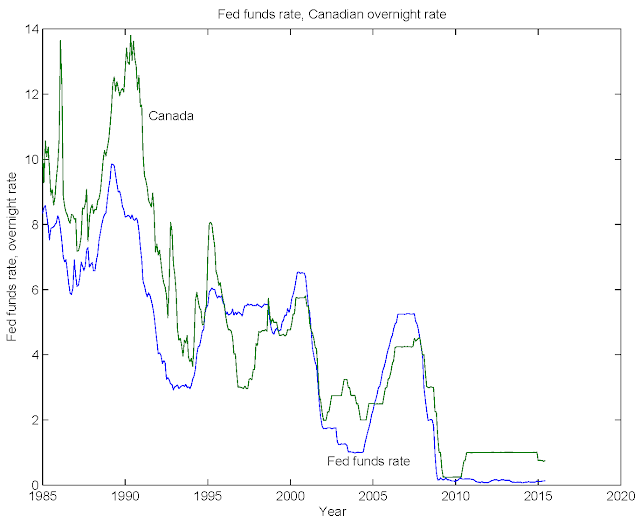 In 1991, the Bank of Canada adopted an inflation target of 2% for the consumer price index. How did that work out? 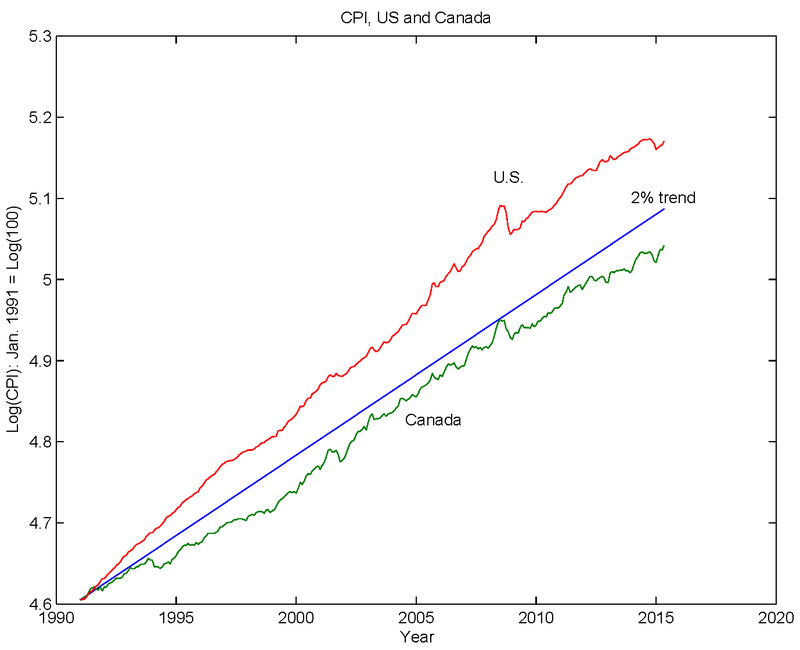 You can see in the chart that the Bank of Canada has been successful, since 1991, at achieving their 2% inflation target. 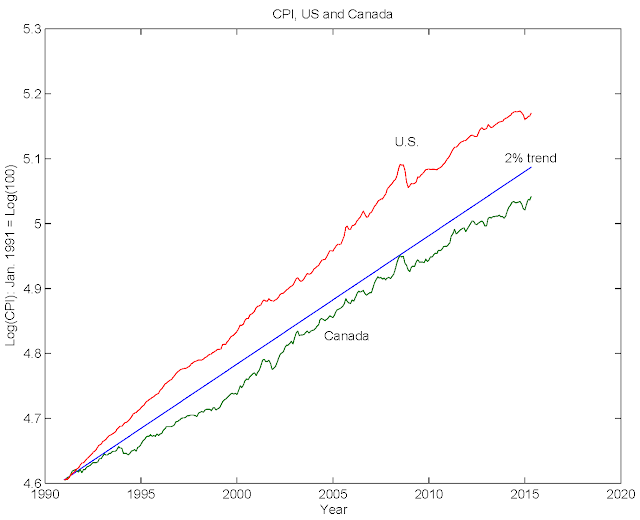 In fact, the CPI is below the 2% growth path from 1991, and inflation in Canada has on average been lower in Canada than in the U.S. 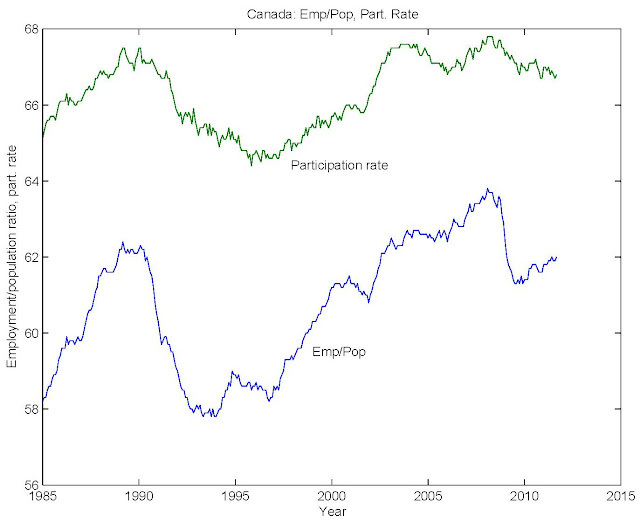 Note that this is particularly the case for the immediate post-1995 period. Thus, if the job of the central bank is controlling inflation, I think we would say that a lower inflation rate is an indicator of tighter monetary policy. In other words, whatever was causing the exchange rate to depreciate in Canada during the 1990s, it wasn't monetary policy. What are we to conclude from this? 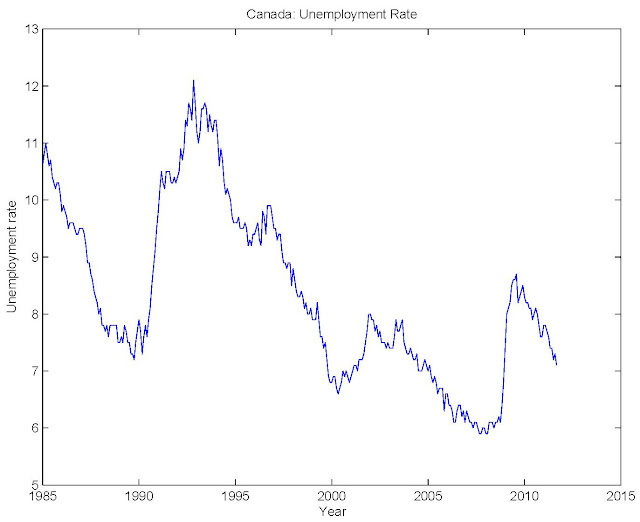 Post-1990 Canada certainly looks like a country with successfully managed fiscal and monetary policy. The federal government brought fiscal policy under control and reduced the burden of government debt, and the central bank adhered to its announced inflation target. How did they do it? In the 1995 federal budget, some well-liked social programs, including government health care, remained more or less intact, and cuts were made in a politically palatable way. Of course, it didn't hurt that the U.S. economy was booming at the time. Are there lessons that we can translate to Greece in the current era? Only the obvious I think. Political stability and good government are important.